Claude Thomas David, the 8th son and 11th child of Jean Pierre David and Marie Magdelaine Monmellian, was born on 20 December 1735 at Louisbourg and baptised the following day, 21 December 1735 . His godfather was his older brother, Michel David, and his godmother was Marie Therese Perrin. Fre Isidore Caulet, RR, presided at the baptism for the Abbot. Witnesses attending the baptism were Dreville and Marie Josephe Lemoiniere. Very little is known of Claude Thomas' life story between 1735 and 1763. His name is listed in only 2 primary source records, including, his baptism record in 1735 and the Louisbourg Census of 1749 to 1750. 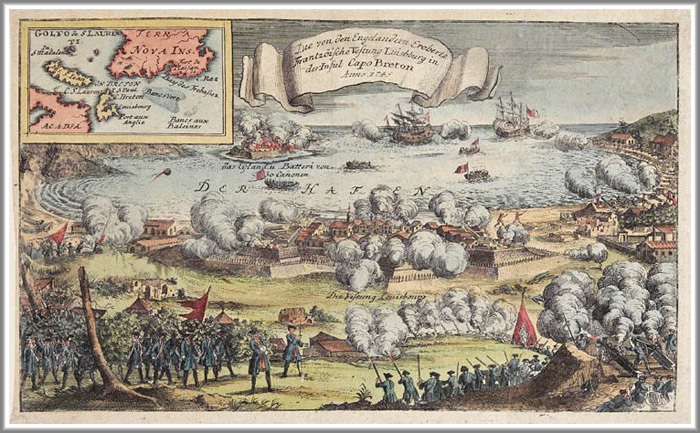 He served his country as a seaman by profession in one of the Louisbourg marine regiments and was captured, along with his 2 brothers Louis and Jacques Andre by the British during one of the conflicts which lead up to the 2nd siege of the Fortress of Louisbourg in 1758. As prisoners of war, they were transported by the British first to Bristol, England in 1759, and later to Southampton on May 14, 1763. They were then transported to France on May 26, 1763 on the frigate La Dorthee. No further record has been uncovered of Claude Thomas' life after 1763. The last 4 of Claude Thomas' siblings to be born at Louisbourg were Jacques Andre born on 30 November 1737, Jeanne Olive born on 10 July 1739, Marie Magdeleine born on 16 January 1741 and Jeanne Angelique born on 21 December 1743. According to the Fortress of Louisbourg Historical Memoranda Series 1964 to Present H F 25 1989 titled Jean Pierre David dit Saint Michel: Blacksmith authored by Eric Krause of Krause House Info-Research Solutions, Jean Pierre and Marie Magdelaine were still living at Louisbourg in 1744 along with their surviving children of " 5 boys for certain, possibly 6 and 5 girls." These children would probably have included their sons Jean Jacques, Jean Baptiste, Francois, Louis, Claude Thomas and Jacques Andre and their daughters Marie Josephe, Francoise Charlotte, Jeanne Olive, Marie Magdeleine and Jeanne Angelique. Michel, their oldest surviving son, had married Genevieve Hebert on 20 January 1744 in Grand-Pré, Acadie and was probably living there with his wife in 1744. This memoranda also states "In 1749, David returned to Louisbourg with 9 children and an orphan. Additional sons and daughters were: Joseph, Joseph and Anne Bernard (orphan)". However, it is believed that the Louisbourg 1749 - 1750 Census may have been misinterpreted and that Anne Bernard was not part of this family. 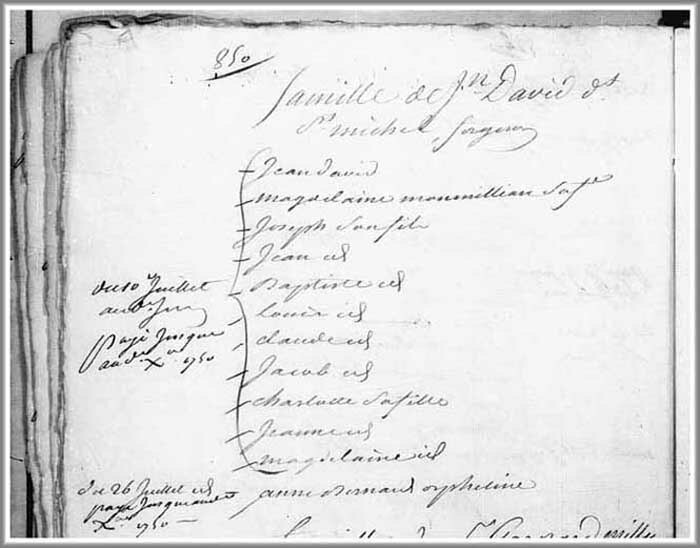 Claude Thomas' documented presence in Louisbourg is recorded in a Family Reconstitution File of his father, Jean Pierre David, which is archived at the Fortress of Louisbourg National Historic Site of Canada. This Family Reconstitution File was abstracted and compiled from original source documents archived at the Archives of Canadian and the Archives Nationale. Further documented evidence which notates Claude Thomas in Louisbourg during this period has been extracted and compiled from original source documents into the Fortress of Louisbourg Historical Memoranda Series 1964 to Present H F 25 1989 titled Jean Pierre David dit Saint Michel: Blacksmith authored by Eric Krause of Krause House Info-Research Solutions.